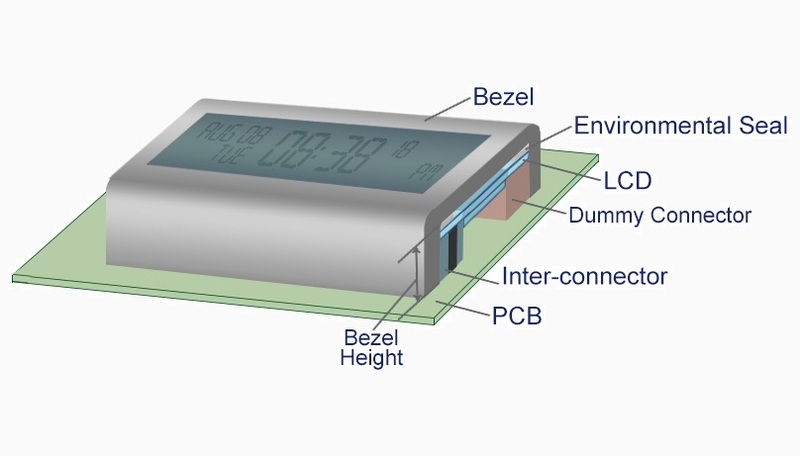 Function : Establish contact between the LCD & PCB . All elastomeric inter-connectors are 'custom made' Zebra connectors offer a wide variety of application possibilities. Unlike other connectors, they do not entail soldering to make reliable connections. They require a minimum of installation hardware considerations, allowing for very small packaging structures to support low profile display and microelectronic interfacing. When properly dimensioned, long-life performance can be assured and airtight connections without additional precautions can be realized. 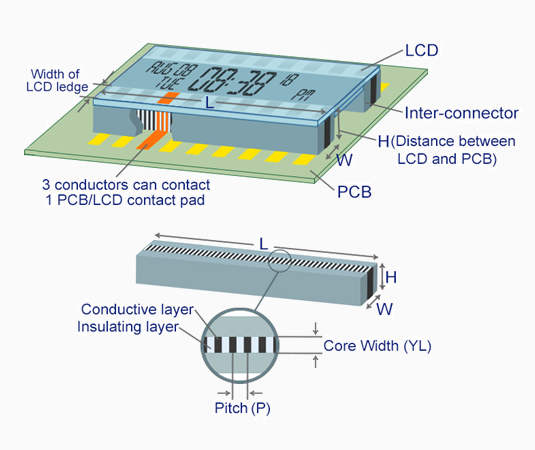 More than three (3) conductive contacts per electrode of PCB/LCD. 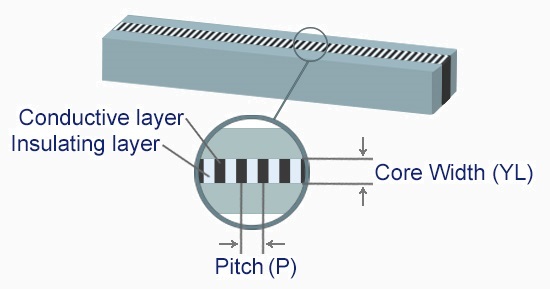 Alternate layers of insulation width (i) & conductor width (c) silicone material evenly spread over the entire length of inter-connector. Basically, 2 conductors per electrode are often adequate, but 3 conductors per electrode are always recommended to ensure reliable connections and to eliminate "intermittent contact"
Inter-connector pitch = 0.18 mm is recommended"
The overall length is recommended to be extended a min. of 0.5mm beyond the edge of the contact at each end of the connector. W ≤ width of LCD ledge. Its design is critical in eliminating buckle when clamping force is applied to the connector. If the buckle is too severe, contact shall lost completely. If connector width is too thin, it may require holder to facilitate assembly, prevent accidental side contact & eliminate alignment problems. 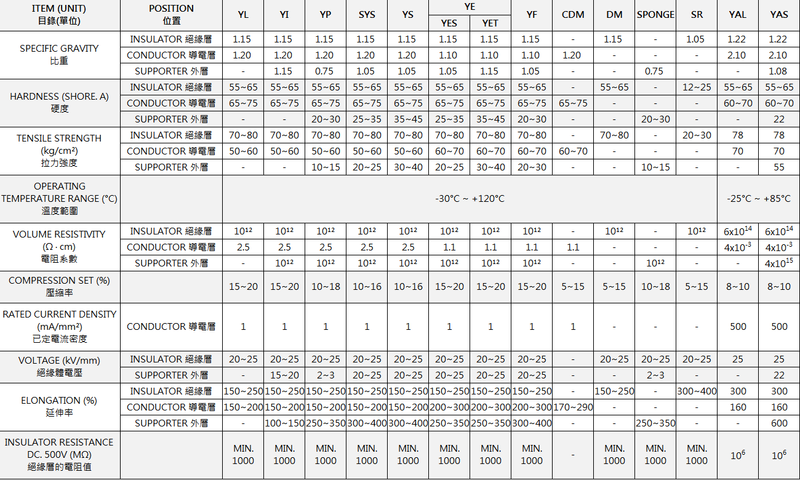 Connector height is determined by the separation distance between LCD & PCB, including tolerance variations. It is critical to calculate the correct compression ( deflection rate ) to be applied to the connector for reliable connections. 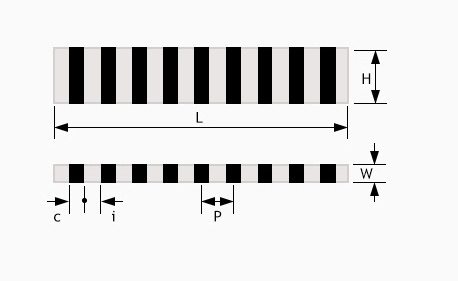 Compression ( deflection rate ) to be applied to connectors varies with different types, dimensions of inter-connectors. Compression load should be spread evenly over the top surface of the inter-connectors. To avoid bending, we recommend to use holders especially for tall height inter-connector. Holder should give space for horizontal expansion of the inter-connector during compression. Conductive width is important in determining the cost, resistance and hardness of the connector. For connector width > 1.3 mm, the more conductive material a connector contains, the more expensive it is.